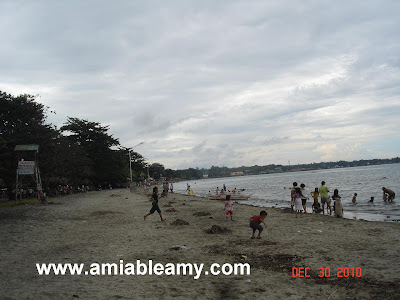 The picture below was taken at Opol, Misamis Oriental Philippines specifically in Marbella Beach area. The place was crowded for so many Christmas Party gatherings at this time. Luckily, I was able to attend the Christmas get-together party by my XU Library Kapamilya for this year. The water on the beach was so inviting yet, I chosed to stay on the cottage to mingle with my long-lost friends/co-workers in the library. I miss this place. In college days, Marbella is the favorite venue for my Glee Club group, library family and friends hangout. Looking for a beach resort near Cagayan de Oro City in the Philippines? Visit Opol, Misamis Oriental. grabe jud kadaghan tawo diri labi na atong Christmas ug new year sis busa sa bonbon nalang mi... eheheheh!